All invoices created in Studio Ninja will automatically copy to Xero. All invoices edited in Studio Ninja will automatically be updated in Xero. All invoices deleted in Studio Ninja will be voided in Xero. Optional - All payments recorded in Studio Ninja will automatically be updated in Xero and vice versa. Step 1: Go to Settings > Integrations page. Step 2: Click the 'Integrate' button within the Xero box. You will be redirected to a Xero login screen. 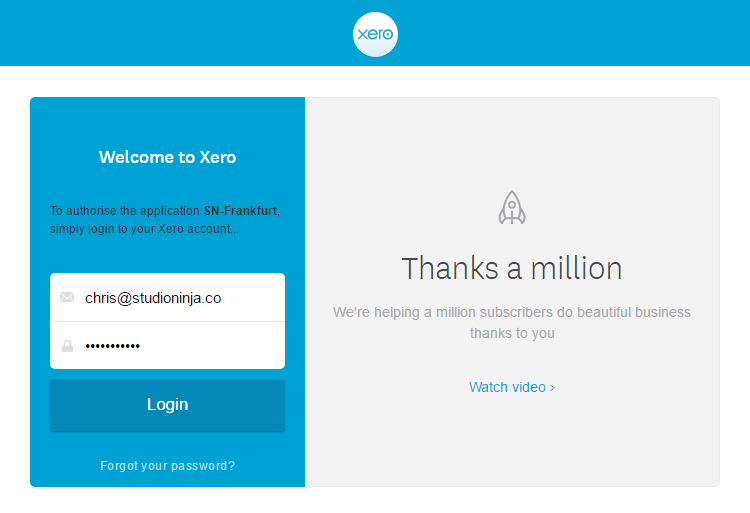 Login using your Xero credentials. Step 3: After logging in successfully, you will be redirected back to your Studio Ninja account. A lightbox will appear asking for some remaining details to finalise the integration. 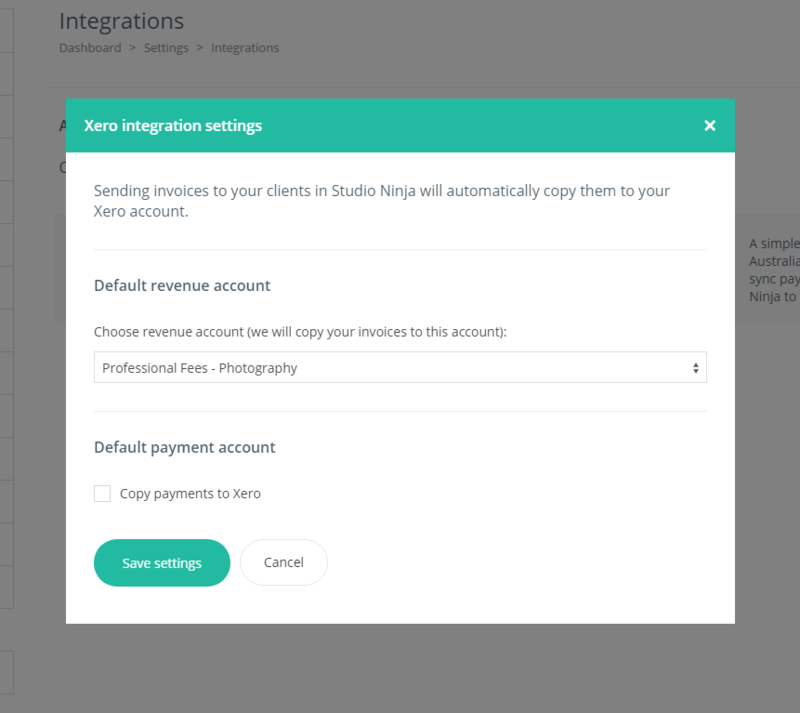 Step 4: Choose which default revenue account you would like your Studio Ninja invoices to copy to. A Revenue Account is an account that records your invoices. Step 5: This step is optional. Choose if you would like to copy payments received in Studio Ninja to Xero. If you (or your bookkeeper / accountant) record payments in Xero then this option is not recommended. A Payment Account is an account that records payments received for invoices in Studio Ninja. The name of this account as it appears in the Studio Ninja dropdown menu reflects your settings in Xero. You can view your existing accounts and create new ones on the Chart of Accounts page in your Xero dashboard. Cannot find an account in the "Choose payment account" dropdown? Your account in Xero may not have payments enabled. Find out how to enable payments in Xero here. Step 6: Click the 'Save settings' button and your integration will be complete! IMPORTANT: From this point onward, every time you create, edit or delete an invoice in Studio Ninja, the same action will occur in Xero. All existing invoices will not be copied to Xero. 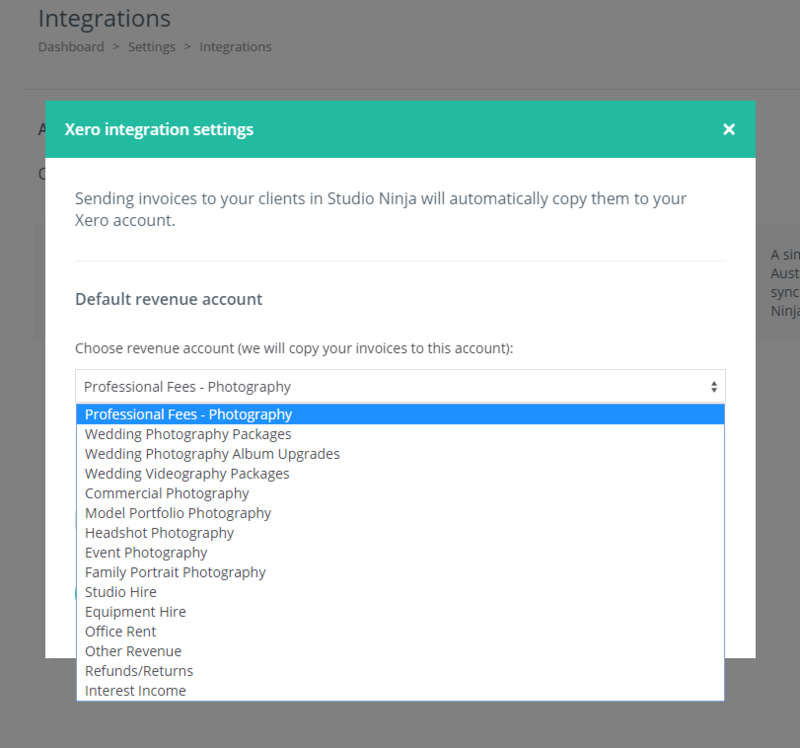 Now that your integration with Xero is complete, your settings options will change. You will now be able to 'Edit settings' and 'Disconnect' your Xero integration at any time using the buttons within the Xero box. 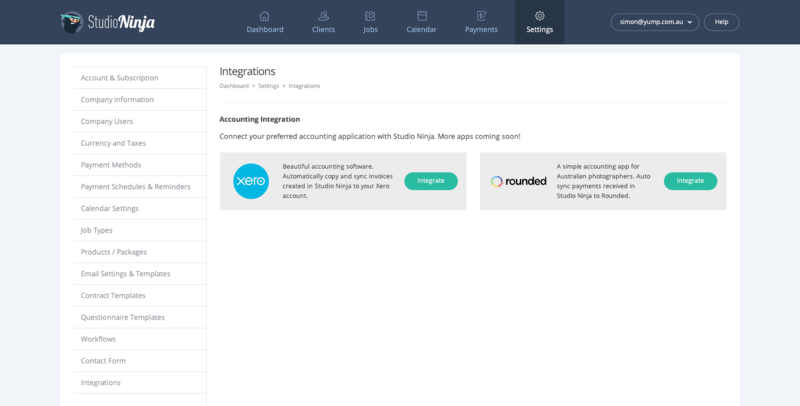 Now that you have successfully integrated Studio Ninja with Xero, let's explore the integration in action! Every time you create a new invoice, you will see a COPIED TO XERO stamp on the invoice. This means that the invoice has been successfully copied to your Xero account. As you can see from the screenshot below, the invoice has automatically been created in your Xero account. The Job Name associated with the invoice will also appear on your Xero invoice for easy record keeping. Edit Invoice: Feel free to make changes and edit invoices. The changes you make will automatically be applied to your Xero invoice. Delete Invoice: If you delete an invoice from Studio Ninja, the invoice will automatically be voided in your Xero account. 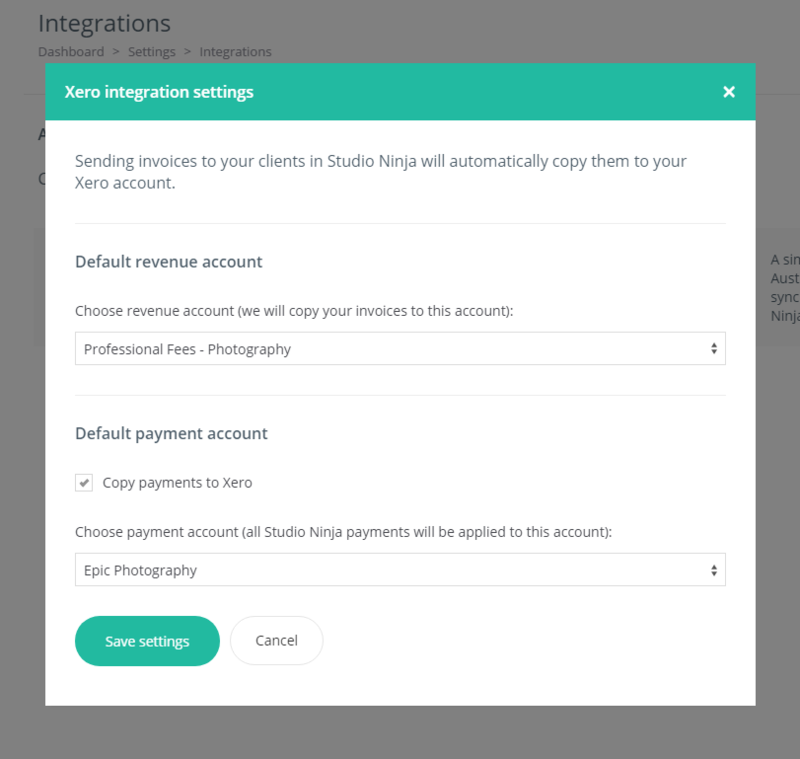 If you manually receive a payment in Studio Ninja using the Record Payment feature, the payment will automatically be applied to the invoice in Xero. If you receive a payment by Stripe, the payment will automatically be applied to the invoice in Xero. If you receive a payment by PayPal, the payment will automatically be applied to the invoice in Xero. IMPORTANT: If there is a glitch, for example, a temporary internet outage at the time of saving the invoice in Studio Ninja, the invoice may not copy to Xero successfully. In this instance, the COPIED TO XERO stamp will not appear. 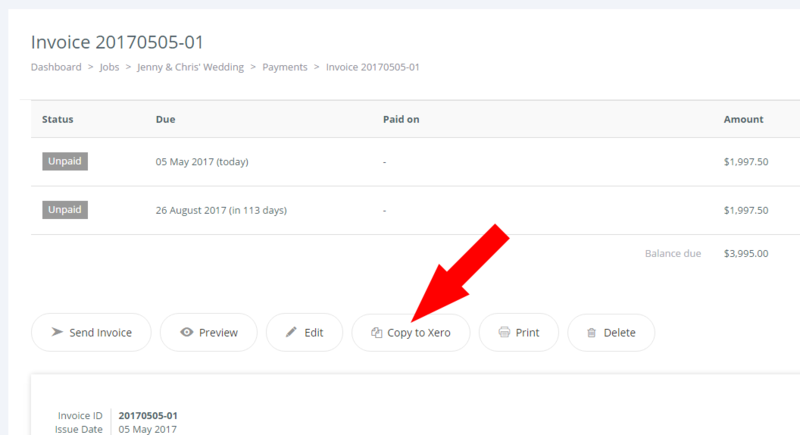 If you notice at any time that the COPIED TO XERO stamp is not visible, simply click the 'Copy to Xero' button and Studio Ninja will copy the invoice to Xero again. If you void an invoice in Xero. If you edit the total invoiced amount in Xero. If you change the primary contact in Xero. If you add a product / package to the invoice in Xero. If you change the tax amount in Xero. If you chance the date of the invoice in Xero. If you change the invoice ID in Xero. If any of the above scenarios occur, you will see a DISCONNECTED - XERO INVOICE ALTERED stamp appear on your invoice in Studio Ninja. Once an invoice has been disconnected, any changes made to this invoice within Studio Ninja will no longer be copied to Xero. There are a couple of ways to resolve this situation. 1. Click on the 'Copy to Xero' button in Studio Ninja. This will copy the invoice and all its data to Xero again so that it matches Studio Ninja exactly. 2. You can go back to Xero and undo what you did that caused the disconnected stamp. For example, if you changed the invoice total amount in Xero, the invoice will become disconnected. Go back to Xero, update the total amount back to what it was originally, and automatically the invoice will reconnect itself. As described above, it is really easy to copy your invoices and existing invoices to Xero using the 'Copy to Xero' button. If the math is easy to work out, change past invoices to percentage discount so that the discounted amount is the same. Then sync / copy to Xero. If the math is not easy to work out, you can remove the discount, but change the invoiced total to the lower discounted amount. Then sync / copy to Xero. If the math is not easy to work out AND you want to keep the fixed discount as showing in the invoice, you can recreate the invoice in Xero with a negative line item.